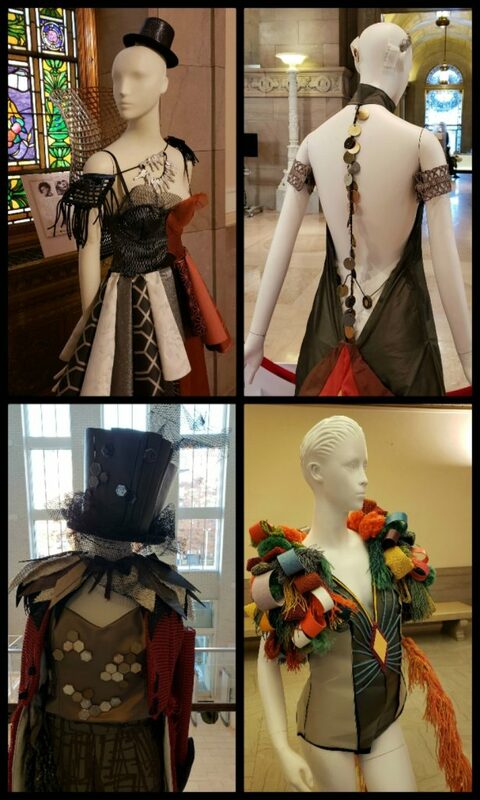 Central Library’s newest exhibit shows off the fantastical and amazing pieces of avant-garde fashion created as part of the IIDA (International Interior Design Association) Gateway Chapter’s 2018 fashion show. With the theme of “Under the Big Top,” these pieces were designed and created by local design and architectural firms using unconventional materials. At first glance, these couture designs appear perfectly typical . . . but get closer and you’ll discover glass tiles, upholstery, laminate, hardware and much more. You may find yourself leaning in for a closer look to see if you can guess what these innovative designers used in their creations. 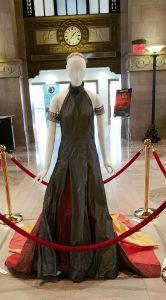 If you’re a fan of Project Runway and eagerly anticipated the “unconventional materials” challenge each season, this is the perfect time to stroll through the library! For fans of avant-garde fashion, this exhibit is a treat. 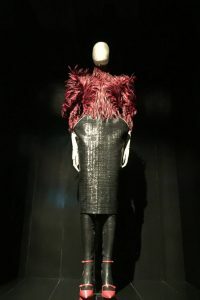 Compare, for example, one of the designs from Alexander McQueen and one of the designs in the exhibit: both are dramatic silhouettes with eye-catching materials. If these weren't captioned, would you know which was which? Stop in any of the rooms in Central Library and pick up a flyer about these amazing pieces, complete with a map of where to find the different mannequins in the building. There are also display cases in the Great Hall filled with accessories designed as part of this fashion show. We also invite you to visit the display of books in the Fine Arts Room. Whether you are fluent in fashion and design or new to the creations of Issey Miyake, Elsa Schiaparelli or Alexander McQueen (or just curious), we have plenty of materials (filled with beautiful color photos) for you to take home and enjoy. We find this current exhibit inspiring and hope you do, too!